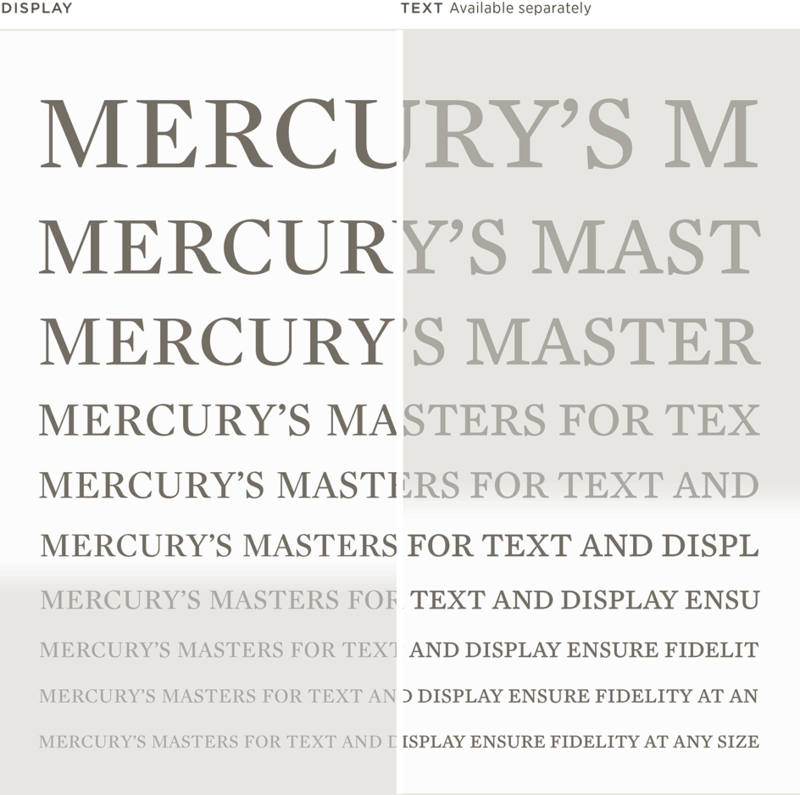 Mercury Display Font Features: Optical Size | Hoefler & Co.
A font for all sizes. The size of a typeface affects not only how it reproduces, but the way in which we experience it. Because we expect different things from fonts at different sizes, Mercury comes in two different versions that ensure peak performance at every size. 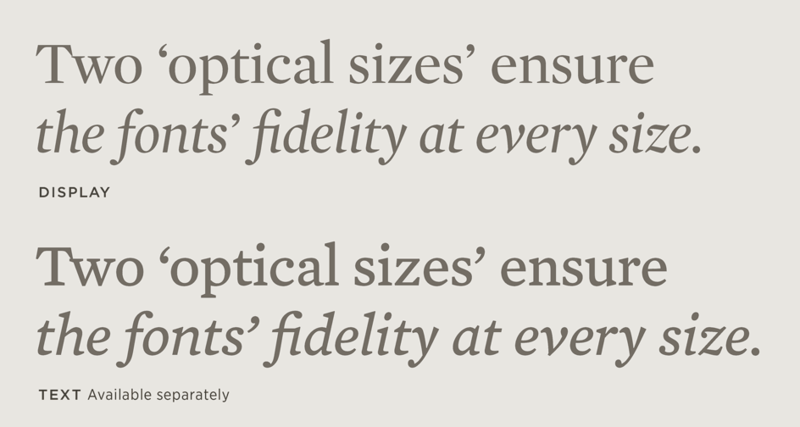 At small sizes, typefaces are designed to favor distinguishability. Letterforms at text sizes need to be as open and clear as possible, in order to resist the effects of limited resolution (whether it’s a shortage of pixels or an abundance of ink.) But they must also be unambiguous, a requirement which emphasizes letters’ differences rather than their similarities. A good text face will use every possible technique to heighten the differences between similar characters — even changing a design’s core proportions, or dispensing with its most noteworthy characteristics — to ensure that the lowercase l, capital I, and number 1 are as easy as possible to tell apart. But the controlled inconsistencies that aid reading at small sizes become thundering distractions when enlarged. Our brains are conditioned to immediately detect the tiniest disruptions in a pattern — the hole in a screen door, a sweater’s loose thread, the one discolored bathroom tile — and though a good text face can distribute its inconsistencies evenly, the details of a display face seldom have anywhere to hide. A good display face therefore emphasizes consistency over distinguishability. Add to all of this the simple mechanical problem that thin lines get thinner as they get smaller. A typeface whose design depends on contrast between thin and thick strokes is especially susceptible to this effect, and the greater a typeface’s contrast, the more its design needs to be adjusted as it gets smaller. Mercury, whose serifs should always be as sharp as possible, is therefore designed in two different masters: a Display family for large sizes, and a Text family for small ones.